It took ten years, and will need another three to be completed, but by September 11th this year there was something to show, at Ground Zero - which Mayor Bloomberg wants us to call the 9/11 Memorial. My view of it is partly positive. Featured is a plaza, with over 400 trees to give shade and quiet, in the middle of a busy city; and in the very places where the two destroyed towers stood, a pair of sunken waterfalls with victim names inscribed on the rims. If I had lost someone on 9/11, I think I would appreciate the tastefulness of all that, rich in symbolism and quiet respect. It's been designed by a committee representing victim families, and the Port Authority of NY, ie government; and as much as a third of its billion-dollar cost has come from 600,000 donations. The rest was stolen by the people who caused the disaster, but that one-third adds merit. Upon the plaza will be a museum, not yet finished, and if that were to show the truth about what happened a decade ago, it too would be a fine feature. The chances of it doing so however are slim to none; until the Government Era is ended, I cannot see its contents illustrating the account given here this month in Zion, for example. So instead it will endlessly repeat the whitewashed tale we have been told ever since, recounting the details but failing to place them in perspective. As noted in a Wikipedia article, if the Museum had been a "think tank" about freedom, it "could potentially criticize American policies." Oh, no, that would never do! Let it not be supposed for an instant that the blame for 9/11 lies in any degree within the US of A! Three other aspects of what is being built on these 16 acres are unsatisfactory. 1. Access is being restricted. Unlike every other memorial park I've heard of, if you want to wander around this one you have to get a permit! They are free, in cash terms; but since privacy is priceless, their real cost is huge. Nobody goes in, whose identity is not on file - so nobody enters on impulse; you have to plan ahead. This is obscene. 2. The site is guarded by thugs with machine guns, as noted by NBC's Brian Williams when he interviewed President Obama. This, along with #1 above, tells us that government fears a new attack. In turn, that tells us that the conflict which led to the one ten years ago has not been resolved. They have had ten years, yet they have utterly failed to fix it. That is pathetic; even in WW-II, a vastly greater conflict, the ten years from (say) 1939 to 1949 turned Germany from a hated enemy into a friend whose capital was supplied with food by an airlift. 3. One World Trade Center, the 1,776-foot needle tower under construction within the plaza, may be a gross and vastly expensive error. Its design is interesting; unlike the two it replaces, loads are borne not by an outer shell but by an immensely strong inner core, presumably able to withstand impact from a colliding aircraft. I wonder if that's true for planes packed with bombs as well as jet fuel. Don't anyone offer me a penthouse near its top; or not without a good parachute and windows that open quickly. Its cost is said to be $3 billion; I wonder what the floor rent will be, to return value on that investment? 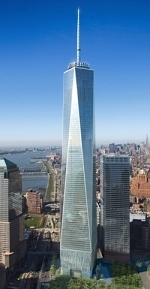 - or does that basic calculation not worry the builders, for this may be a symbol of defiance, not a profit center? Might it be (forgive the vulgarity) a finger raised to the enemy and an assertion of US government supremacy, rather than a true business venture consistent with the American freedom and independence implied by its height in feet? The rentable floor space will be 2.6 million sq ft, so the building cost will be over $1,150 per square foot, which seems to me astronomical even for NYC. If in fact this is a symbol of defiance, it says again that under tight government mis-guidance, America has still not come to terms with the fact that 9/11 was not a surprise attack by terrorists, but retaliation by sufferers of extensive US aggravation. Assertion of continuing enmity and dominance, even after ten tumultuous years, says that government is absolutely reprobate and incorrigible. No reform is possible. These people know what should be done and stedfastly refuse to do it. Therefore, they have to go; government needs not to be corrected, but to be abolished. Any time spent on trying to improve it is time wasted; every last trace of it needs to be eliminated, as fast as can be done. The means to do so is readily available; if you, gentle reader, are not already on board, please put that right today.